Updated on March 20, 9:55 p.m.
Student Action for Responsive Leadership (START-AIT), local arm of Nagkakaisang Iskolar para sa Pamantasan at Sambayanan (KAISA), will have to share its two-term territory with STAND UP-AIT, local arm of the Student Alliance for the Democratic Rights in UP (STAND UP) next year, as both parties split wins Thursday in the three-party battle for the Asian Institute of Tourism Student Council (AITSC) elections 2014. 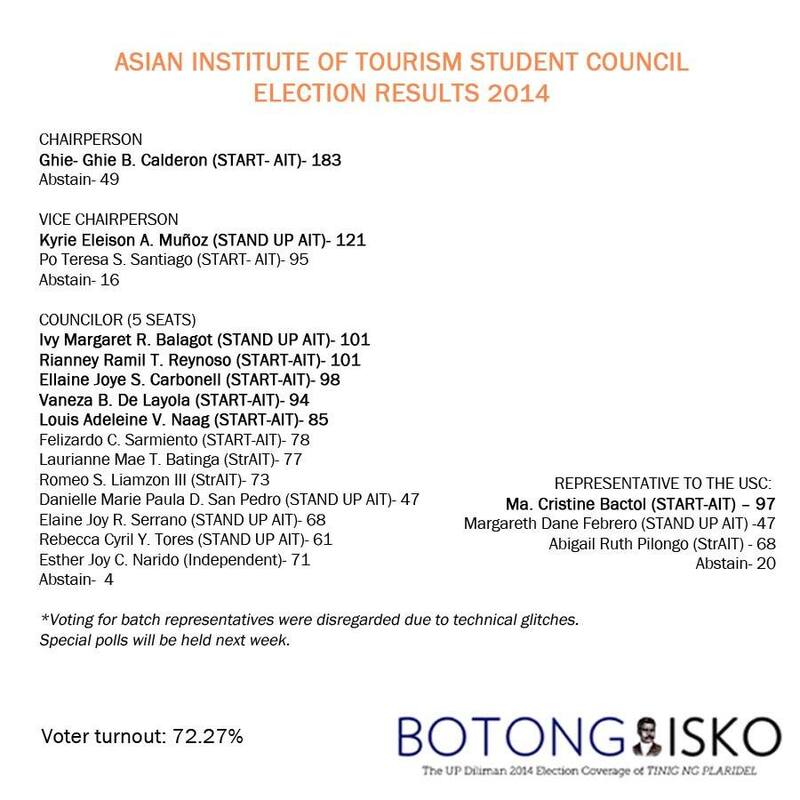 START-AIT chairperson candidate Ghie-Ghie Calderon beat the abstain votes with 183 against 49 votes. Meanwhile, Kyrie Eleison Muñoz of STAND UP-AIT won against START-AIT’s Po Teresa Santiago for vice chairperson with 121 and 95 votes, respectively. Tin Bactol will be the AIT Representative to the USC at 97 votes, winning over STAND UP-AIT’s Marga Febrero with 47 votes . Abi Pilongo of Strength in Tourism in AIT (StrAIT), the local arm of Alyansa ng mga Mag-aaral para sa Panlipunang Katwiran at Kaunlaran (ALYANSA), came third at 68 votes while 20 abstained. Candidates Ivy Margaret Balagot (STAND UP-AIT) and Rianney Ramil Reynoso (START-AIT) both garnered 101 votes and shared the top spot on the list of AIT councilors. Due to technical problems in the voting polls last February 27, voting for Batch Representatives were held on March 7 . Freshman Jessa Osorio from Strength in Tourism in AIT (StrAIT) got 13 votes and will become the next Second Year Representative after beating Fershelyn Ann Callejo’s 9 votes. There were 23 out of 49 freshmen who voted, a 46.94 percent turnout. Bea Jinela Iwarat from START-AIT ran unopposed for the Third Year Representative post and garnered 24 votes, winning over 9 abstain votes. Sophomores’ turnout was 49.25 percent with 33 students voting out of 67 registered voters. The Fourth Year Batch Representative is StrAIT’s Clarence Pauline Fuentes who beat Vanese Arielle Capito with 29 votes and 18 votes respectively. Only 53 out of 136 eligible students voted, a 38.97 percent turnout. During the original election day, the AIT CSEB recorded a 72 percent voter turnout, a slight decrease from last year’s 77 percent. Only 232 students voted out of 321 eligible voters.